There's a bit of a typo in GA Vol. 07, not that it affects anything major, but it did make me check that I was reviewing the right book ^^; The top of each page says GA2010 Summer even though it still has Vol. 07 next to it, which lets you know the page formatting is definitely identical to the last volume. Also like the last volume, GA Vol. 07 is 24-pages including the covers, B5-sized, and printed on lightly textured paper. 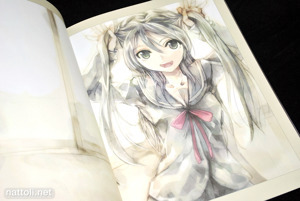 KEI, best known as the character creator for Hatsune Miku, continues to include Vocaloid illustrations, though not nearly as many as before. 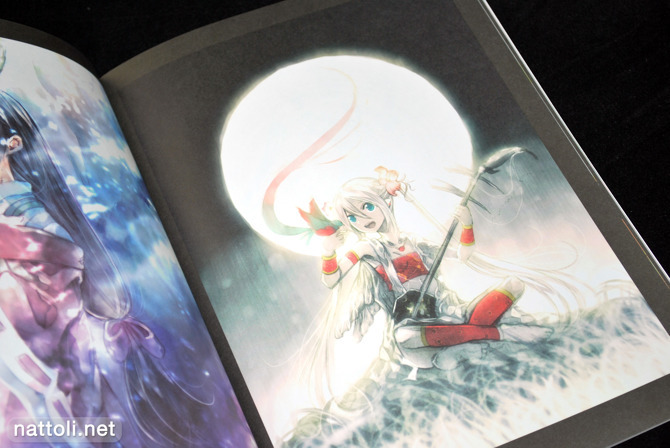 Aside from a picture of Kagamine Rin on the opening page, the only other Vocaloid illustration features Lily (リリィ). Also included are fan arts from The Idolmaster, Shinryaku! Ika Musume, Love Plus and Black Rock Shooter. As far as re-occurring original characters, KEI has once again illustrated his two black and white cat girls, who also appeared in the last volume of GA. The cover girl also appears to be the same character, with an even more detailed finish than in GA 2010 Summer. Touhou comes back strong in GA Vol. 07 with four character illustrations. It's hard to believe KEI started out with Touhou, and used to have whole doujins dedicated to it. All in all, GA Vol. 07 maintains the high quality standards KEI's set for himself in this doujinshi series, with another collection of new and beautiful art works. Pfft, if it's so fun then why so slow on the WATER scans? >;D That's a small book! I dont know what you mean, but so far 90% of the scanned books were rly well picked imo. There is also alot of other books reviewed trough the internet and if you want something different then here try to use google (for example oga kazua artbook review). 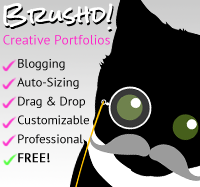 I just wanted to say thanks for such a great site. I bought that limited edition Chocolate Gouache set (so lovely) after seeing it reviewed here and this is probably my next buy. I buy a fairly large amount of art books and it's so nice to be able to see previews instead of buying and just hoping for the best. 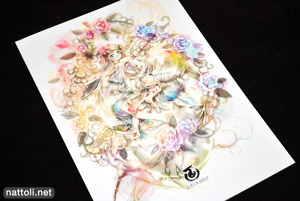 Hello Nat, do you know in which kei's artbook i can find this art? It's printed in his original doujinshi, GA Vol. 01/2006. Can you give me any tips how it's look like?